First of all, let me say how difficult it is to take photos of etched glasses! I did my best but the photos below aren't great and don't reflect how they look in real life. 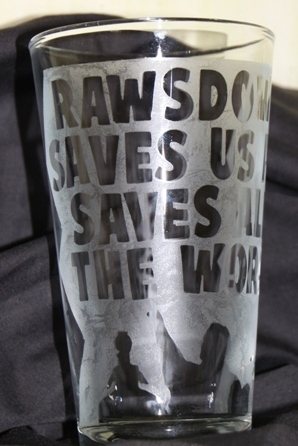 "Rawsdower saves us and saves all the world!" from Mystery Science Theater 3000 episode "The Final Sacrifice"
"Big McLargeHuge," "Punch RockGroin" and "Buff DrinkLots" from Mystery Science Theater 3000 episode "Space Mutiny"
My brother just finished his master's degree and the Mystery Science Theater 3000 glasses were for him. 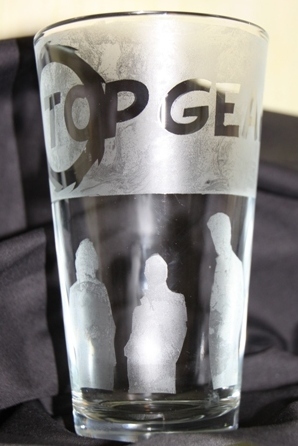 The Top Gear and Arrested Development glasses went to my husband on his birthday. I used this tutorial from The Yummy Life which explains how to do the lettering and this video from ashram6 on Youtube which shows how to use adhesive contact paper to make images. I'll explain the process briefly, but see the tutorial and video above for more details. Clean the glass thoroughly with rubbing alcohol and try not to touch the glass afterward. Place the letter stickers on the glass to form words. Make boxes around your words with painter's tape. For images: Draw or print out an image the size needed. Trace the image on to the contact paper, cut out and put on the glass. Use painter's tape to box off any negative space around the image. Make sure everything is stuck on well so the etching cream won't sneak underneath. In a well-ventilated area (this stuff stinks! ), put on your safety gear and use a popsicle stick to put the etching cream on the glass. Leave it on for about five minutes, using the stick to move the cream around twice during the wait. In a stainless steel sink (the cream can damage other types of sinks), wash off the etching cream with hot water and remove all the tape and stickers. Wash the glass and you're done! Etching cream isn't perfect and the results won't look store-bought. You can tell from my photos that it doesn't etch evenly. 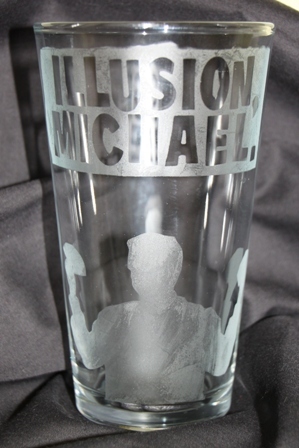 The bigger the area you try to etch, the more evident the unevenness is. The etching cream is caustic and dangerous so it's not a good project for kids, though they could decorate a glass and then an adult could take over when using the cream. 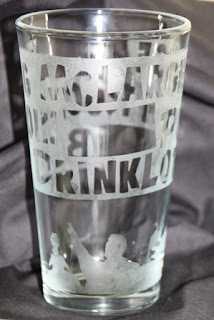 Still, with some planning and patience a custom etched pint glass can make for a unique personalized gift.